Research has suggested that ballet training may encourage young students to suppress negative emotions, demonstrating potential psychological harm of ballet. Whilst this is rather a bold statement, research has revealed that studying music, for example, promotes a variety of cognitive and emotional benefits, whereas the results are more mixed for dance training, ballet in particular. There are a number of benefits of training in dance, however it seems the potential dangers are just as rife. In 2014 for example, a meta-study concluded dancers’ risk of having an eating disorder is three times higher than that of the general population, and that dancers had higher levels of “psychological inflexibility” , a state of mind that has been linked to anxiety and depressive symptoms. Here, psychological inflexibility has been defined as excessive involvement with internal events, such as emotions, thoughts, and memories. In turn this can affect the way the present moment is experienced for dancers, increasing their fear of failure. 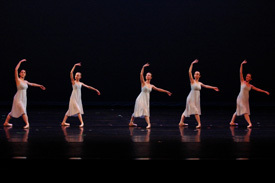 This can therefore prompt dancers to avoid stressful situations rather than accepting challenges. In some ways this conflicts with general findings regarding dancers, in the way they work at and deal with problems. However, the results ultimately indicate that dance training produces some undesirable psychological pressures, in the link between dance training and perfectionism. While it’s possible that children who are predisposed to perfectionism are drawn to this exacting art form, their levels of psychological inflexibility could be explained by some characteristics of ballet training. Dance – and ballet in particular – involves high levels of discipline and physical demands, competitiveness, and highly critical attitudes, as well as the acceptance of emotional and physical suffering through the experience of training. The research therefore concludes that dance teachers need to be aware of these issues, and encourage young and aspirating dancers to vocalise their feelings, whether they are positive or negative.